Just like the movies, except for everything. Thanks as always, TJ! Another fun review of a weird, nonsensical, show that outside of this review, is probably better off forgotten. Another tragic find from the 90s (really how many screwed shows are from that decade), but a great episode. So brownies for TJ. I love those Schwarzenegger ads. DAI-JOU-BUI!!! This is one of those shows that wasn't bad, it just wasn't good. It's kind of there. I pretty sure I knew this was crap when I was watching it - and that was the main appeal to me...I was a fan of the first two movies...The third sort of lost me with the whole collage angle. The one thing I really remember about this is the "3D animation" of the plane/van. I remember watching this show from beginning to end really liking. Then I grew up and you are pretty much right and even though it was a big part of my childhood... hell that made it even easier to laugh at this review. Good work. 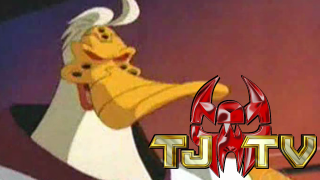 I like your JT character what would be funnier would be if his world's bad movies were good and good movies were bad and if the names of movies were also changed and if in his world the acting casts were also opposite. or if he was reviewing Space Jam. Idk, I LOVED this show as a kid. It was in my top ten easy. The characters get way more flushed out as the series went on. When I was a kid my only complaint was that chameleon was too small to ever be a threat to the heroes.